There is little in British colonial history that casts as dark a shadow as what some have labelled the Aboriginal Tasmanian genocide. At the time of British settlement in 1803 there were an estimated four to seven thousand Indigenous Tasmanians, by 1847 there were just 147. While some mixed-race communities endured, the last full-blooded Tasmanian, Truganini, died in Hobart in 1876. Intense debate has raged amongst historians over how the demise of the Tasmanian people should be defined. Niall Ferguson calls it ‘one of the most shocking of all the chapters in the history of the British Empire’, and states that it truly warrants labelling as genocide. Others, such as Henry Reynolds, argue that demographic decline was due to losses sustained in conflict with the colonists, rather than a direct policy of genocide on the part of the government. More controversially, some outright deny the culpability of the colonial government. Keith Windschuttles’ infamous work The Fabrication of Aboriginal History challenges the general view. Windschuttle argues that Aboriginal society collapsed due to susceptibility to disease and its cultural mistreatment of women, perhaps overlooking the fact that Tasmanian culture had endured for around ten thousand years in isolation. How could it transpire that a country championing liberty and the abolition of slavery could oversee the extinction of an entire peoples? The Tasmanian population, which had survived ten-thousand years in isolation, would cease to exist after just seventy-three years of colonial settlement. The colonial history of Tasmania was from its beginning synonymous with brutality. Originally a distant outpost administered from Sydney, the island became home to Australia’s most hardened convicts. Penal settlements such as Macquarie Harbour were said to have been some of the harshest in the Empire. Struggles with the Aboriginal population started almost immediately following the arrival of the British in 1803. Various initial confrontations with native communities culminated in a skirmish at the Risdon Cove penal settlement in May 1804, when two Aboriginal men were killed by soldiers. This account clearly demonstrates that, forty-five years before Truganini’s death, the British were conscious of the fact that the Tasmanian peoples were at risk of extinction. Great Island (soon to become Flinders Island) was chosen by the Committee as a suitable location, owing to its inaccessibi. Arthur considered that ‘escape is quite impossible, as is kidnapping by sealers…there is plenty of game, it is possible that the natives may also here pine to return to their native land, but it is imagined that the amusement of hunting would occupy their minds.’ So it transpired that the last home of a homogeneous Tasmanian community was what Robert Hughes called ‘a benign concentration camp’ on Flinders Island. A ten-thousand-year-old culture was sacrificed to accommodate settlers who had arrived just under thirty years ago. The remaining Aboriginal communities in Van Diemen’s Land still had to be persuaded, or forced, to ‘come-in’ and resettle. The Black Line military campaign, during which armed men sought out any resistant indigenous communities, has been interpreted by some as an attempt at extermination comparable to the Nazi Einsatzgruppen. George Augustus Robinson, a missionary dubbed the ‘evangelical pied piper’ by Robert Hughes, was successful in ‘bringing-in’ some of the most resistant groups. By January 1832 Arthur had written to London that ‘the most sanguinary of the tribes, under the chiefs “Montpeilliatter” and “Tonger Longter”, who have always acted in unison, have at length been conciliated by the friendly mission under Mr.Robinson.’ While official government papers portray this roundup as a reluctant policy carried out with Aboriginal interests in mind, many of the settlers saw it as a license to kill, and violence persisted. In 1835, the last of the Tasmanians were resettled. On Flinders Island, disease and distress led to rapid population decline, and by 1847 the 47 who remained were resettled in Hobart. Truganini, the last full-blooded Aboriginal Tasmanian, died in 1876. 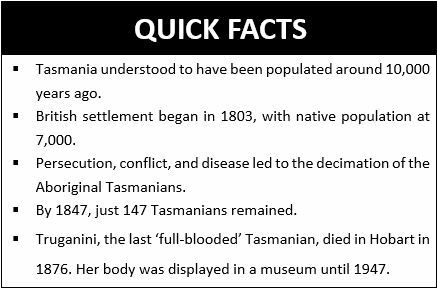 Tasmanian remains became sought-after scientific property as their numbers fell, and were utilised in a number of eugenic studies. The body of the last Tasmanian male, William Lanne, was exhumed for study, while Truganini was displayed in the Hobart Museum until 1947. Benjamin Madley calls Tasmania ‘probably the most terrifying place in the British Empire a white person could live’, and the settlers focused unapologetically on their own safety and protection of their livelihoods. British practice and policy had failed to provide this protection, and settlers were compelled to take their security into their own hands. This proved catastrophic for the Tasmanian population. Policy also failed, to a much more severe degree, to protect the Tasmanians, who by the time of George Arthur’s plans for resettlement had been galvanised in resistance to a force they felt was intent on the invasion of their land and the eradication of their people. As the extent of the problem revealed itself, attempts at solution were made in desperation, not to save the Tasmanian people as such but rather the reputation of the Empire. The solution would fail, and the memory of Tasmania served to erode any conceptions of the British Imperial benevolence. The British reaction to this decimation in practice was fuelled largely by a complete misinterpretation of indigenous cultures with regards to connection to ancestral lands, as well as a prevalent sense of inferiority as determined by the imperial racial hierarchy. Moreover, the need from the British to gain from the colony – originally in terms of establishing successful penal settlements, and then to cultivate a self-sustaining white-outpost within the expanding British Empire – vastly outweighed the need for contemporary authorities to accommodate the original inhabitants of that land. What is perhaps most telling in the story is an ambivalence towards the horrors which indigenous Tasmanians were enduring. The overriding fact is that as long as the colony thrived, the British regarded Aboriginal plight as a matter of fact, and, overwhelmingly, simply did not care.